J.S. Russell and D.A. 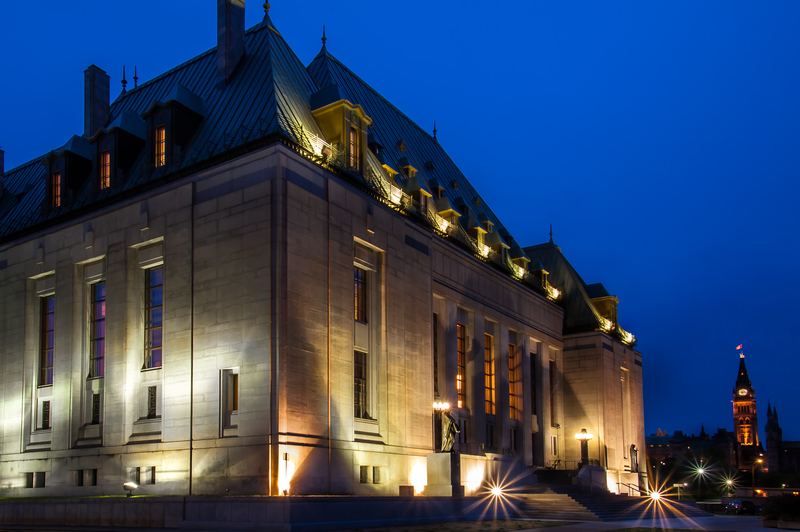 Browne discuss the Supreme Court of Canada’s historic decision to strike down the ban on physician-assisted dying. An historic decision must start with history. The Carter v. Canada case began a few years ago when civil rights lawyer, Joe Arvay, gave a keynote talk at a function sponsored by the B.C. Civil Liberties Association (BCCLA). Arvay used his talk to challenge the BCCLA to take on a legal test of Canada’s ban on assisted dying. After that talk, BCCLA lawyer Grace Pastine approached Arvay and they put together a team of litigants and lawyers, including Gloria Taylor (who suffered from ALS, or Lou Gehrig’s disease), other patients, private physicians, and the BCCLA. Together they crafted what is certainly the most important legal victory affecting all Canadians in the post-Charter era. What a victory it is. A unanimous 9-0 decision by the Supreme Court justices. To emphasize their agreement, the justices took the further step of not reporting the author(s) of the decision. Symbols matter. The absence of a named author reflects the special depth of the court’s accord, one that cut cleanly across so-called “liberal” and “conservative” voices on the court. Those who are wondering how the court could have come to an unreserved conclusion on such an apparently controversial topic should have a look at the arguments submitted to the court. These were a brilliant and unprecedented marshalling of legal, moral, and sociological evidence. In effect, Arvay and his colleagues closed the door on any fair-minded effort to sustain the current regime. The court concluded that not only had the legal landscape changed since the Rodriguez decision in 1993 confirmed the prohibition on physician-assisted dying, the moral landscape had changed too. But the truth is that it changed only slightly. The evidence for physician-assisted dying was nearly all there in 1993. The court’s decision confirms the idea that respect for human dignity requires honouring individual autonomy and preventing suffering. Opponents of physician-assisted dying have always struggled to find a conception of human dignity to compete with this idea. They have been left to rely upon speculative, unsupported arguments about practical slippery slopes—that is, abuses and losses of trust that could follow physician-assisted dying. They have also relied on an alleged moral distinction between killing (in the form of administering or prescribing a lethal medicine) and letting die (in the form of withdrawing or withholding life-sustaining treatment). The evidence was largely there in 1993 against slippery slopes. Withdrawing and withholding life supporting care has been practiced legally and responsibly by the health care professions, without specific regulation, for generations. It is practiced far more frequently than physician-assisted dying will ever be, and it is open to exactly the same potential abuses. These have never materialized. It should have been little surprise, then, that the court’s review of recent evidence from jurisdictions that now permit physician-assisted dying confirmed no good evidence of slippery slopes. As well, the killing and letting die distinction was never sound. Aside from deep controversy over whether the distinction is coherent, it sidesteps the fundamental question about what values are engaged by physician-assisted dying. It has always been formalism masquerading as moral argument. It was mentioned but not discussed by the court, and rightly so. We continue to hear these arguments, of course. But we will hear less of them. Indeed, what has gone missing in the critics’ hand-wringing over slippery slopes is the potential this case presents for a virtuous slippery slope. How so? We have seen this already in Canada. For the same objections to physician-assisted dying were raised a couple of generations ago over withdrawal of the new life support technologies. It would lead to losses of trust and abuses, particularly among vulnerable groups. But those concerns were unfounded—and misguided. Indeed, palliative care emerged and developed as an essential sphere of medical service once health care workers became intimately involved in end-of-life decisions. It is not too much to expect that systematic attention to policy around end-of-life decision making, of the sort the Supreme Court is now asking government to take up, will emphasize the need for respectful palliative care, to everyone’s benefit. Indeed, this is the challenge government and the medical professions must now take up—how to make dying with dignity a reality for as many as possible. Unfortunately, the need for legal protections over assisted dying is not ended by this case. The decision limits physician-assisted dying to competent adults who have a grievous and irremediable illness that causes intolerable suffering and who clearly consent to the termination of life. This leaves many incompetent adults and children who face irremediable and intolerable suffering without the opportunity to die with dignity. Canada has taken a long, if too long awaited, first step. Others still remain to be taken. J.S. Russell, Philosophy, Langara College, is a past president of the B.C. Civil Liberties Association. D.A. Browne, Instructor Emeritus, Langara College, is a member of the B.C. Civil Liberties Association Board of Directors. I agree intent matters, but it is not like the doctor over-prescribing pain-killers is thinking “Well I will just give drugs to relieve pain.” and later thinks “Oops! The patient died — well, back to medical school for a refresher class on proper drug administration!” It was painfully obvious to most that the reason the doctor’s over-prescribed painkillers was to help the patient to die. So the intent was the same in the “letting die” case as the “killing” case. This is notably unlike a manslaughter case where the killer really didn’t intend to kill anyone but was criminally careless. So I am with the Supremes on this one. Whenever a medication is prescribed (for any reason), there are risks and indications. The physician and patient assume some amount of risk with the hope of achieving some benefit when a medication is prescribed. For example, one side effect of statins (drugs designed to lower cholesterol) is that you might suffer muscle aches. The benefits often outweigh the risks, and the drug is prescribed anyway. The physician knows the muscle aches may occur anyway and, in conversation with the patient and their wishes, may even choose to continue the medication despite the side effect. The intent is to lower your cholesterol, not cause muscle aches, even if the side effect is a foreseen possibility. The same goes with offering analgesia at the end of life. The intent of the physician is offering higher doses of analgesia (typically in the form of opioids) is not to end a patient’s life, or because he is ignorant of how to manage the administration of the drugs. The intent is to reduce pain, with the foreseen side effect of respiratory depression. The medications are up-titrated to achieve pain control, weighing the risks and benefits. The benefit of pain relief outweighs the risk of respiratory depression. This flies in the face of centuries of study and use of the principle of double effect. It is incredibly morally relevant whether an act is committed to bring about the death of the person, or whether the act is committed to bring about some other end. Note, also, that this is how it is determined whether criminal defendants are charged with first degree murder, second degree murder, or manslaughter (voluntary or involuntary). Intent matters! In forensic language, mens rea matters! If you deny this, then you deny significant swaths of the processes of criminal law, not just medical bioethics. I think this distinction is important. While it doesn’t address the question, “Why does this patient want to die?” it addresses a different question: why would it be wrong to seek the death of a patient? That’s an important question too. And I think in answering that question, we come up against many of the same issues we might find in the debate about PAS/E: what constitutes human dignity, what constitutes harm, what rights and duties physicians and patients have, what value is in life. Withdrawing and withholding care is not subject to “exactly the same” potential abuses as physician-assisted suicide and euthanasia (PAS/E). Unfortunately, the provision of care is probably abused too much in the other direction: that is, people receive life supporting care to the bitter end, in ways that increase suffering. I would consider that an abuse of the technology we provide that is meant to heal a person’s life but instead degrades it. The abuse of PAS/E would develop just as subtly. I don’t think we would see many cases of the son, full of impatience, trying to get his father to shuffle off this mortal coil so we can inherit the state sooner. But what I do think we’ll see, through decades, is the development of a culture of death, in which ability is the prized metric of value. If you lack ability, then your life lacks value (by degrees). This development can be demonstrated using an argument from a paper by Velleman. If your friend were having a dinner party but didn’t invite you, your default state is “not going.” You don’t need to make a choice not to go. But if he invites you, you either must choose to go or not to go, but the one thing you cannot choose is to “not go by default,” that is, not go by not choosing. The offer of the “right to die” in these cases is similar. Most of us do not go through life consciously choosing not to kill ourselves; rather, we live by default. As soon as someone offers us the opportunity to die, however (for whatever reason), we can choose to live or die, but the one thing we cannot do is live by default. Say we choose to live. We are responsible for our choices, no? And those choices for which we’re responsible we also can be asked to justify. Now imagine showing up to work every day and being asked why, based on some publicly and culturally valuation of life, you didn’t kill yourself last night.